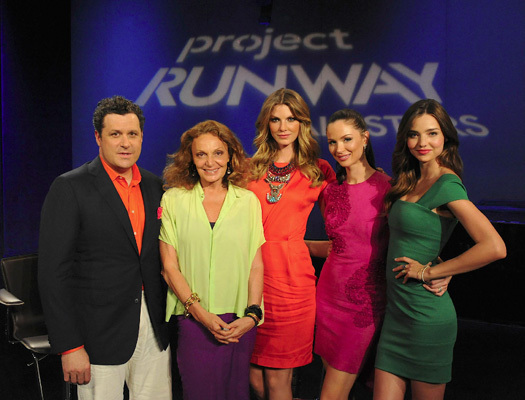 Lifetime Network has turned “Project Runway” into a conglomerate of shows. “After the Runway” revealed interviews of eliminated contestants. “Models of the Runway” was an interesting peek into the flip side of what the models on the show experience, and the latest one “Project Runway All Stars” followed by “Project Accessory” and “24 Hour Catwalk”. "Project Runway All Stars" contestants. “Project Runway All-Stars” returns 13 of the “most talented and memorable designers” according to a press release to compete for the grand prizes of: a designer’s boutique in select Neiman Marcus stores and on NeimanMarcus.com, $100,000 in technology and office space from HP and Intel, $100,000 cash from L’Oreal Paris, a feature spread in Marie Claire and serve as a guest editor for one year for the magazine, and a sewing and embroidery studio from Brother International. The thirteen unforgettable contestants who were all runners’ up of their seasons are: Anthony Williams (Season 7), April Johnston (Season 8), Austin Scarlett (Season 1), Elisa Jimenez (Season 4), Gordana Gehlhausen (Season 6), Jerell Scott (Season 5), Kara Janx (Season 2), Kenley Collins (Season 5), Michael Costello (Season 8), Mila Hermanovski (Season 7), Mondo Guerra (Season 8), Rami Kashou (Season 4), and Sweet P (Season 4). High-fashion model host Angela Lindvall. ‘All Stars will be hosted by high-fashion supermodel Angela Lindvall with famous designer judges Isaac Mizrahi and Georgina Chapman. The show’s make-it-work go-to mentor in place of Tim Gunn is Maire Claire Editor-in-Chief Joanna Coles. “Project Runway All Stars” premieres January 5 at 9pm ET/PT on Lifetime.